Back View: Each piece is signed and dated, and the pendant floats freely​ on an adjustable length, satin jewelry cord that passes through an internal channel. To adjust the length of the necklace after slipping it over your head, pull gently on the two end beads, the beads will slide over the cord to shorten its length. Then slide the two inner beads until they touch the two outer beads, The final look is one of elegant simplicity, and the back is finished with a natural fiber paper. 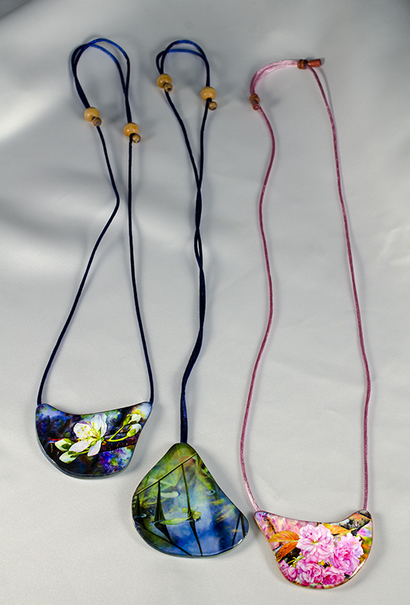 My watercolor paper pendants represent a process that has been ongoing since the early 1980s when I transitioned from working in metal jewelry to experimenting with materials that were more related to what I was doing in painting. During that time I began to explore the possibilities of making jewelry using nontraditional materials such as wood, fabrics and paper, and my experiments led me to discover that layering watercolor paper and gluing the layers with archival, book binding adhesives resulted in an extremely durable, composite jewelry object. Because I was building the basic jewelry shapes with watercolor paper, I began to approach my jewelry as miniature shaped canvases onto which I painted either abstract or representational images that were closely related to my actual paintings on canvas. The process became addictive and evolved over the years, and I've been working with it ever since then to make jewelry. The series offered in my shop represents my most recent work in which I incorporate reproductions of my "paintings on canvas" onto the jewelry object. The reproductions are printed with Epson UltraChrome ink on archival watercolor paper, and the final jewelry object is coated with multiple layers of an acrylic, UV protecting varnish. The varnish is baked in an oven to achieve an extremely hard and durable surface, and the final piece is mounted on a color coordinated, size-adjustable satin cord that hangs approximately 16 inches at its maximum length. I approach each pendant as an individually handcrafted miniature work of art, but if you are not completely satisfied with your purchase upon seeing it, return​ it to me and I will refund 100% of its cost.